When the BP team has the ball in their defensive third (BPO) prevent them from playing out into midfield third unopposed and attempt to, win the ball back as quickly as possible in our attacking third to get a shot on goal. 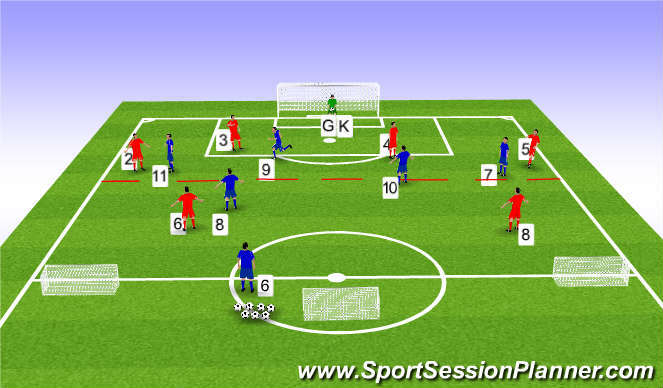 If the ball is passed back to the GK can the 9 get into a position to pressure the pass from GK? AS the BP player in posession prepares to pass leave enough space to encourage pass to their closest player but be close enough to pressure player as they receive pass. If we press as a unit the chances of winning the ball back are increased. All players to play compact and squeeze opposition into small area, this makes passing through our lines difficult.